Which sentence is ordered correctly? A. We climbed into Dad's red, rusty, old pickup truck. B. We climbed into Dad's old, red, rusty pickup truck. C. We climbed into Dad's rusty, old, red pickup truck. C is ordered correctly. It's obvious, right? To those of us who are native English speakers, it's the only one that "sounds" right. To my ear, A and B just sound awkward and clunky. 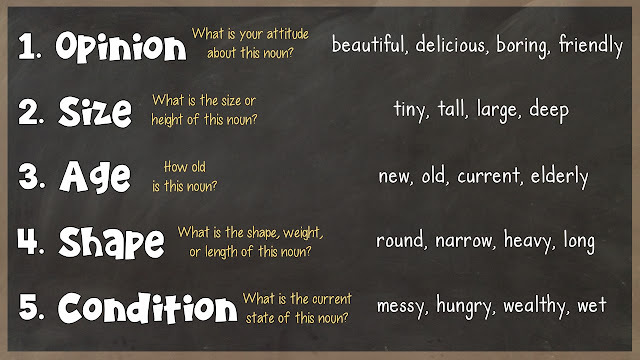 I must confess, that's how I went about figuring out the order of adjectives for the first 30-some years of my life. I went with what sounded right. Then, I met up with the Common Core State Standards... CCSS ELA-Literacy.L.4.1.D to be precise. Order adjectives within sentences according to convention patterns (e.g., a small red bag rather than a red small bag). 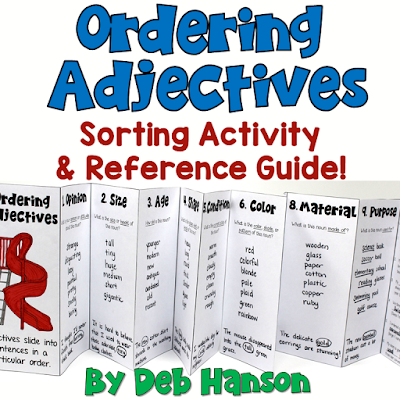 Yep, it turns out that there are "rules" when it comes to ordering adjectives. A few weeks ago, a friend emailed me and asked me if I would be willing to create some resources to match this fourth grade standard. I jumped at the opportunity. As an ESL teacher of 14 years, I believe this is an important language standard. It struck me that I had been able to get along just fine for decades without knowing any specific "rules" regarding the placement of adjectives within sentences by just figuring out which option "sounded right". The ELLs in our classrooms, however, often aren't quite as lucky. Most of them simply do not have the advantage of being able to determine which option sounds "right", and which option sounds "clunky". I set out to create a handful of engaging, student-friendly materials to address this standard. 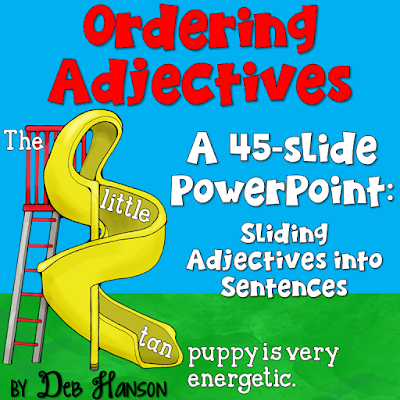 As you can see, most of the materials I created are related to the idea of "sliding adjectives into sentences" in the correct order. Just click on the image if you want to take a closer look! Clearly, I have no recollection at all of learning this when I was younger. 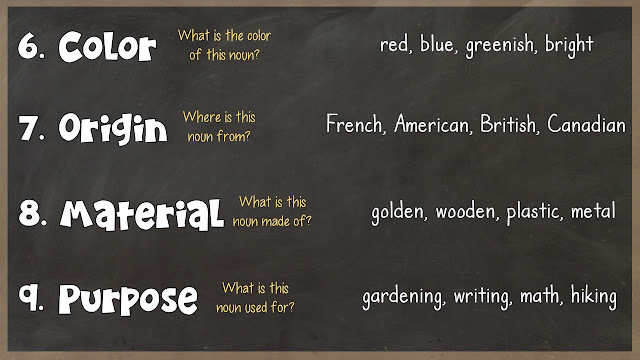 I'm curious... do you remember learning how to correctly insert adjectives into sentences when you were younger? This is terrific. My 5th graders will use this in their creative writing journals. Thanks for sharing.